I have been complaining about Google's app bundling policies in Android over the past decade, I think those Google policies are anti-competitive but also counter-productive for Google itself. I think Google should support and encourage as much innovation around the Android OS as possible, they should let the manufacturers customize Android devices as they wish, Google should encourage their competitors such as Microsoft, Adobe, Apple, Yandex, Baidu, Alibaba, Amazon, Rakuten and many many other large tech companies should be invited to subsidize Android device by pre-loading whichever other search engines and apps that they would like to pre-load, and they should also be encouraged to adjust, customize, enhance and even to fork Android to add new functionalities to the Android operating system, for example support for other app platforms inside Android, for example support for Windows apps in Android, support for iOS apps in Android, support for Linux apps in Android and much more. I also believe that Google will make more money also when Google opens Android up much more and better, to allow device makers to work with Google's competitors when it comes to apps that are pre-installed, and including also to develop Android fully in the open source space sharing dailies of all daily Android development. Google booth tour at the BETT education technology conference, showcasing some of the newest Chromebooks released for the education market, new security features to help schools prepare for the new General Data Protection Regulation (GDPR) of the EU (more information at Google Blog), collaborative tools for teachers and students, the Jamboard interactive whiteboard display device, Google Expeditions using Augmented Reality and VR. Chromebooks are the leading device for the K-12 education market in the USA and now also in Sweden, Canada and New Zealand with 25 million users worldwide. G Suite for Education is used by 80 million users worldwide. 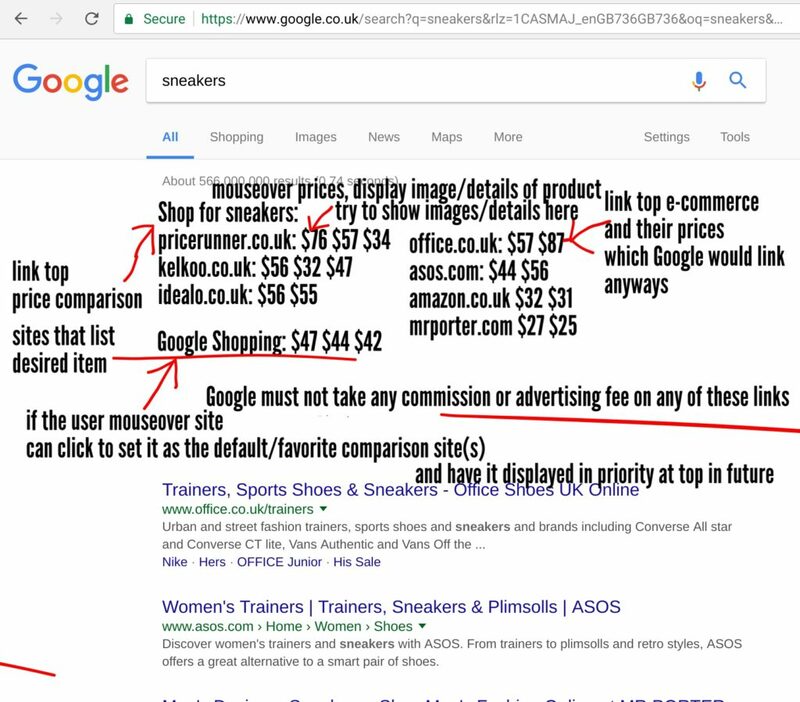 It's important that Google cannot be taking any commission or advertising fees from these competing price comparison sites or these competing online stores like Amazon for them to be listed here. Google must fairly list the top most relevant price comparison sites and online stores which they would list at top of search results anyway. Google must integrate better with competing price comparison sites so they can nicely automatically list the top prices and if possible also grab images, product details to show on mouseover or even if possible integrated in this list if there is enough space. Google can display Google Shopping as one of the options, let's say, probably at the bottom of the list of price comparison search engines listed. Users can customize how these lists are generated, users can choose to show by cheapest price. Users can select one or several favorite sites to always use each time they come back. Just as one can choose a default search engine on Chrome, one must be able to choose one or several favorite price comparison search engines, or for example choose to always only display Amazon Prime results on each search if Amazon Prime is the user's favorite way to buy. A click on a price can lead directly to shopping site, bringing a commission only to the price comparison engine on the sale, not taking any commission to Google on the sale. Unless the clicks are from the area of Google Shopping. 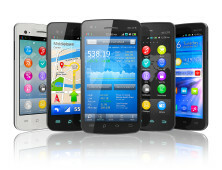 This UI and comparison or top price comparison sites and of top shopping sites must be adapted for mobile. - Same as above Comparison and integration of top Price Comparison engines and of top user favorite stores such as Amazon must be integrated as the Instant Buy Now and Price Comparison overlay on top of every YouTube video. YouTuber must be paid as close to a 4% commission on each sale as possible, regardless the shopping site. YouTuber can choose if limit to any specific e-commerce site such as Amazon or let Google figure out the best comparison sites or shopping sites to show. YouTube may take a fair commission on the sales revenue on YouTube Shopping because the YouTuber choses to link only to sites that give a 4% commission back on each sale. A feature I have been asking YouTube to implement for nearly a decade. To easily allow viewers to one-click to donate any amount to support the YouTube content creator, the YouTuber must be able to enable a Dollar sign to be displayed on the left side of every Thumbs up icon on all monetized videos of the whole channel of the YouTuber. Dollar sign in USA or if viewer prefers to donate in USD currency, this currency icon can also be €, £, ₹, ¥ or whichever based on viewer location (donations must work for any viewer worldwide) and converted in list of top donators to be displayed in the local currency of the viewer who is looking at that list. 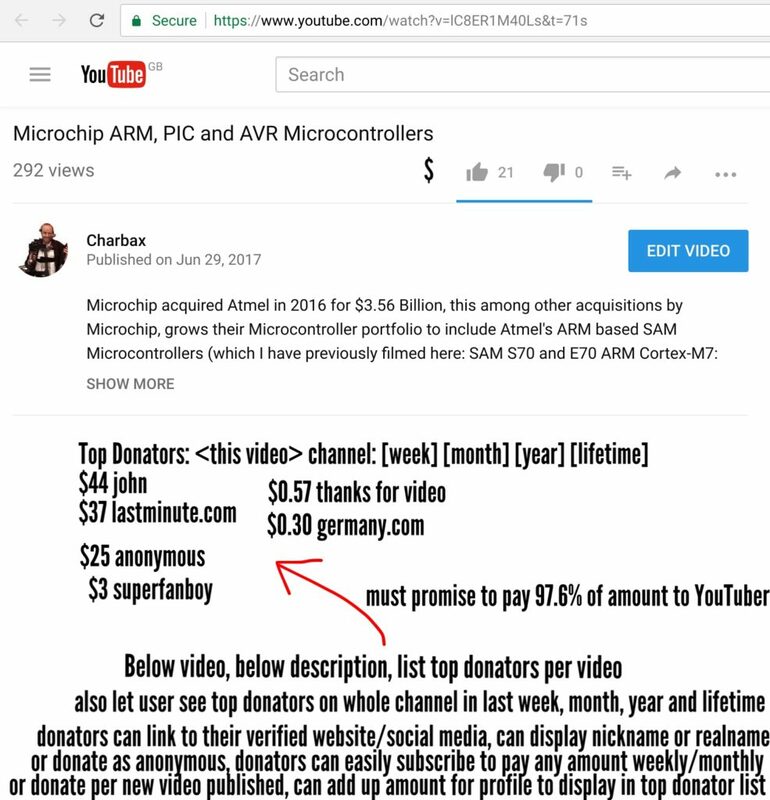 Below the video area, below description, but above comments, it should show the list of the top donators for that video. Viewer can switch to view top donators on whole channel in the last week, month, year or lifetime. YouTuber can limit if these week/month/year/lifetime lists should be shown or not throughout the whole channel of the YouTuber. Donators can decide to display nickname (any amount of text up to short limit), realname, or display their @socialmedia/+googleplus/facebook-link or to display their blog/website/company URL as the donator. Google can be slightly smart and make sure an anonymous $0.49 donation cannot link as mcdonalds.com as the YouTube/Google account holder may have to verify ownership/control over advertised website. When donating, the user can easily choose other ways to regularly support the YouTuber by recurring weekly, monthly, yearly or by payment for each new video posted, or for each 5/10/any number of videos posted. A donator can have his comments highlighted and automatically pushed to the top of comments displayed below. Top donators can highlight comments more based on how much they have donated. There may be some settings that the YouTuber can control as to how much of a highlight the comment can get based on how much the donation amount is set for. This system can thus turn some of the donations into advertising, as people can then show their appreciation for the YouTube content by showing off their blog, website, company as the top donator. As the top donator just for that video or the good idea could be to have companies and patrons/philantropists compete to be the overall top donators/sponsors not just for supporting under that one video, but supporting the whole channel over the past week/month/year/lifetime. A donator can hide their contribution(s), turn those into anonymous and back into public name/company/socialmedia/website at any time. Eventually YouTube can automatically add top donators/sponsors as end of clip "Thanks for the support of:" or any other text customizable. And top donators can even have their logos displayed automatically as end of show credits clip that YouTube can automatically add to specific videos or to the whole channel and to customize over time. 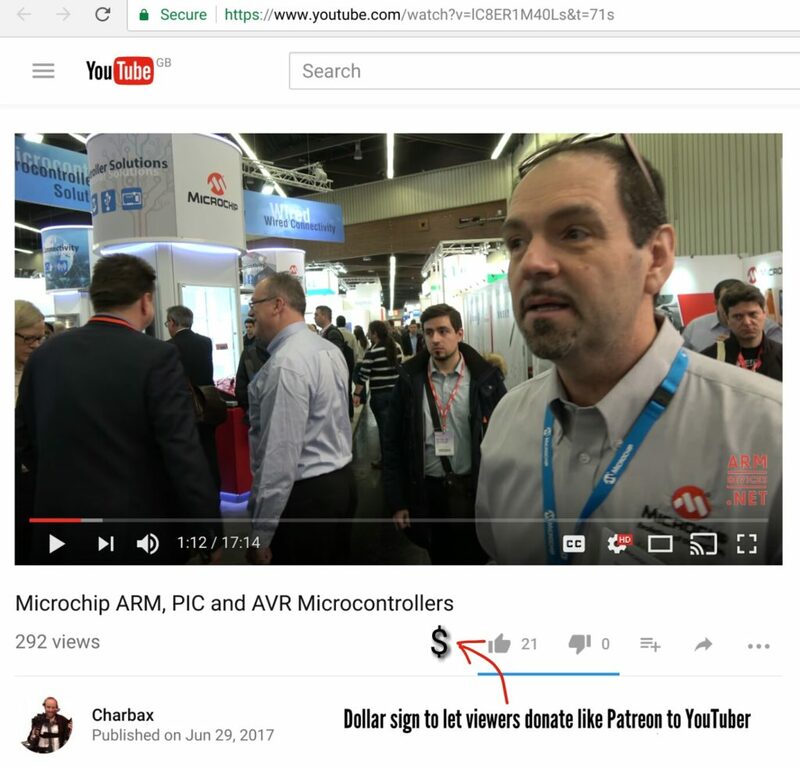 A $20 sponsor may not have his logo in the end of show credits, YouTuber can specify certain thresholds that may or may not unlock that end of show credits placement. A very large donator/sponsor can even be inserted as a brief "Supported by" clip at the beginning of each video, but it must not be permanently inserted in the video, that dynamic credits system should be inserted by YouTube at beginning/end and can just be temporarily. YouTube must not take a commission on the top donations system on YouTube, YouTube may only keep the approximate 2.6% credit card processing fee. This Top Donators system must be considered a system for fans and companies to become Producers/supporters of the content that is created. YouTube can still monetize every video as they usually do with ads, with YouTube Red subscriptions, and with the Buy Now one-click Shopping and customizable Price Comparison system that I specified above. I have been wanting and asking to see a perfect Top Donators systems since 11 years ago when I paid a programmer $350 to get a WordPress top donators plugin made: https://wordpress.org/support/topic/paypal-donations-realtime-meter-top-6-donators/ but I didn't follow up with it much, other than using it on my previous blogs for a few years and collecting something like $1000 in donations through the plugin in total I think. Google is Enabling rich and immersive experiences in virtual and augmented reality, presented by Clay Bavor (at Google since 2005), Google Vice President of Virtual Reality where Google works to create an efficient and scalable software platform for rich VR and AR services to be powered by high performance, power-efficient ARM CPUs, GPUs, sensors, and where Google is also working with the Display insutry to bring amazing new ultra high resolution VR and AR displays to the market. As you can see in this video of the keynote, at the SID Display Week, Google announced they are working with Sharp to create ultra-high resolution LCD displays for VR optimized for very low lag time. Google also works to create 20megapixel per eye prototype VR and AR displays, amounting to 2.5x 4K resolution per eye. And Google is working with ARM and other companies to bring foveated rendering technology to not require the 100-150Gbit/s bandwith for VR and AR content once the microdisplays have such high resolution, this method involves using a camera to track where the eye is focusing and render a very high resolution of exactly what you’re looking at while keeping the resolution and detail lower for where you are not looking at directly, and doing all that accurately with minimal lag time. Linaro CEO George Grey interview on the last day of the Linaro Connect in Budapest 2017, talking about Google joining Linaro as a club member, some of the latest developments at Linaro, the high amount of contributions from Linaro into Linux and open source, IoT, Servers, Mobile, Networking, Kernel, Gateways, Set-top-boxes, Smart TVs, Android, and a lot more. Other new Linaro members are HXT a joint venture between Qualcomm and the CHinese Government, Fujitsu with their new ARM Powered Supercomupter. You can watch George Grey's opening keynote at Linaro Connect Budapest 2017 here. My impressions on the coolest ARM Powered Laptop yet, the Samsung Chromebook Plus ($419 top selling 2-in-1 on Amazon.com) that features a Rockchip OP1 dual ARM Cortex-A72 with quad ARM Cortex-A53, ARM Mali-T860MP4 GPU. The performance is great on this device, with the firmware updates from Google also speeding things up regularly, this device is amazingly cool and aweome. But in this video I mention a few things I am hoping Google can improve in the software, mostly to do with improving the Android apps for productivity, I'd like a 4K video editor that works and that is hardware accelerated, I think that Google needs to help PowerDirector and Kinemaster get hardware acceleration and 4K video editing support on this device. Even better perhaps would be if Google could contact the Lumafusion developers and support them to port their 4K60 video editor to Android and optimized for the OP1 processor. Other missing apps in the Google Play store are Microsoft Office, Popcorn time, I don't want to be setting my Chromebook in Developer mode just to sideload apps that may not even be optimized for the Chromebook yet. Photo editors such as GIMP on Android, Adobe Photoshop need to get supported. Few more other productivity apps for developers, creatives, professionals and students I think need to get ported to this Chromebook Android device. Then Google also needs to improve the features of the stylus touch pen on this device, I'd like the stylus shortcuts and gestures allow to do productive work and study such as annotation collaboration, screen region selector saves to JPG to use as thumbnails in YouTube. In terms of the hardware, I am only hoping to be able to prove that USB Type-C SD card adapter to a USB3 Hard drive file transfers are fully fast enough (as fast as on any Intel Windows machine, hopefully), and also I hope to be able to prove that Wi-Fi performance is just as fast and reliable as with any other laptop. Except the missing backlight on the keyboard and the slightly smaller keyboard than full size, otherwise I think this laptop hardware is pretty much near perfect. It is now my main laptop, I just wish that I could do 4K60 video editing in a good Android video editing app, that the Android and the Chrome OS part get better integrated, for example when I save files in Android apps I want to be able to easily get access and upload these files from the Chrome OS Chrome Browser. I'll be posting more videos about my Samsung Chromebook Plus in the weeks and months ahead as I expect that it will get better with Google's full support. Samsung really needs to soon start selling it in Europe! - Make these available worldwide. $299, $349, $449, $549 with different skews from FHD 4GB RAM 32GB Flash at $299 to 2400x1600 8GB RAM 128GB Flash at $549. Samsung, Asus, Acer, Lenovo, HP, all need to get in on the OP1 flip platform. - Make sure there are 10-20 perfectly optimized apps for productivity covering all the basics people need on a Laptop. At least a few apps that cover "what people need on Windows/Mac" need to work on the Chromebook with OP1, make sure there is 3 perfectly optimized Office apps (Microsoft Office included), 3 perfectly optimized video and image editing apps (should be good enough for semi professionals to do fast rendering smooth 4K video editing and "anything that's done with Photoshop/GIMP"), 3 perfectly optimized Chat/Video-conferencing apps including Skype, Whatsapp, Hangouts, few more "Facebook Messenger", "Snapchat", whatever young people use.. Just make sure there is a good range of very well optimized apps, that will show the way for other developers to also optimize thousands among the 2 million Android apps best suited for productivity. Have 10 "Nintendo-quality" awesome games work perfectly also, for optional gamepad bluetooth gameplay on large display or with any cheap $10 Type-C to HDMI on a HDTV. Google can offer "free" app re-optimization support to the developers who have promizing Android apps that just need to be slightly upgraded to work great on large display and well optimized also for keyboard/mouse usability. - Nougat multi-window resizable. All the features of Remix OS, Phoenix OS, nicely resizable multi-window Android framework needs to be there. - App/extension for perfect stylus annotation collaboration, annotate any webpage, any article, any document, and have collaborators over Google Drive. We also need a perfect community(ies) for "the annotated web", when you select any text and you type in your comment/annotation on the keyboard. Needs to be ultra smooth and easy to use to make this revolutionary for productivity. It has to be a must-have for any student, for any professional and for any creative. If you select any text on any article on any webpage that has a comment section, then that selected section is automatically "quoted" when you type your comment, hit enter to post your comment about that selected quote. Or easily Google+1/tweet/blog, write your comment and link when you highlight a text. Thus different configurable modes/features for that pop-up menu when the stylus is taken out of its slot. Some will always want to annotate docs to collaborate in Drive, others will always want to auto-share quote and link article to Google+ or to Blog with typed comment, and easy switch between Stylus modes, should work with any content. Just only being able to annotate/scribble on a screenshot is too basic. - Maximum dual display (external display) productivity, using Type-C to HDMI dongles/docks, it needs to be super easy to "open link in new highlighted or background tab in other window on other display" or to tab browse on one display while Android multi-window apps run on the other display. - Android for productivity on these Chromebooks obviously has to be a taster of what can become available with "Android Continuum" once Android super phones dock with external displays and Lapdocks using DisplayLink, MHL, Slimport or a Chromecast-Continuum background app with Nougat/Miracast. Somehow, I wish the OP1 Chromebooks Type-C port would also allow for Lapdock functionality, to use your external superphone on Kirin 960 or Snapdragon 835 to "speed up" your OP1 Chromebook performance, somehow. Perhaps run some tabs/apps on the OP1 while others can be accelerated by your external phone which might have a more powerful ARM Processor. All the while the OP1 Chromebook also charges your phone by that same Type-C port. Somehow combine the Hexacore ARM Cortex-A72/A53 of your OP1 Chromebook with the Octa-core ARM Cortex-A73/A53 of your phone, also combine the GPUs, to have all these 14 ARM cores work nicely over that Type-C cable or even wirelessly (especially if your phone is the LTE hotspot for your Chromebook) for your optimal productivity. Seriously Google, partner with Microsoft, pre-load Microsoft Office with some amount of included free months of trial for Office 365, pre-load Skype, help Microsoft make a perfect LinkedIn app, and also partner with Adobe pre-load some perfectly optimized Adobe Photoshop and Adobe Premiere for Android, need to be VERY usable, very optimized for Android productivity and also include the Adobe Creative Cloud trial on there. Do this Google. And people will be impressed. No need to "force people to use Google Drive and Google Photos only", you can bundle free trials for your services too (consumers will prefer Google apps anyway if those are better), just make sure the advanced apps people "need on Windows/Mac", that those, even for semi professionals/enthusiasts, that those already work good BUNDLED on Chromebook with OP1. Close the gap and shut down any argument people might have against the Chromebook. Wanna do even more? Convince Apple to pre-load fully optimized iTunes and Garageband on the Chromebook with OP1 also (I'm sure Apple already has secret betas for these apps for Android, ready to release "just in case"). Don't you know how to convince Apple this is a good idea? Let me know, I'll tell you how. Shame them if they don't. Before the end of 2017, Google needs to "open up" the marketing angle on Chromebooks (basically fully supported (same auto security/feature updates) Chromium OS rebrand service for Chrome OS for any competitor), so Microsoft, Apple, Baidu/Tencent, Yandex and Adobe/Salesforce/others will be shipping customized Chromebooks with their apps/shortcuts defaults pre-installed. Don't force anyone only ship with Google apps/shortcuts/search, let the consumers change those defaults if Google is better. Login should not only be using Google account, let users login with any other Microsoft/Apple/Baidu/Tencent/Yahoo/whatever user account. Let your competitors ship your free and open source software and with your usual Chrome OS support when it comes to security/speed/feature updates), help subsidize/promote the platform. Let competitors submit improvements/patches to the platform. Before the end of 2017, sub-$100 ARM Chromebooks need to reach every child in the world, just as OLPC intended more than a decade ago. Don't make OP1 Chrome OS exclusive, let it nicely run anything else. Let people boot into any Linux or into any other OS from MicroSD card or from a simple Type-C Flash memory dongle. So if Microsoft wants people to dual-boot or to replace Chrome OS with Windows 10 (with x86 win32 app emulation support) they should be able to do it. If Apple wants consumers to dual-boot or replace Chrome OS by a new Mac iOSX UI, let them do that. If consumers want to dual-boot or replace Chrome OS by Ubuntu or any other Linux, let them easily do that. Even have staff of Google employees support that and "recommend" stable OSes that work nicely. Always stable "factory reset" to manufacturer's shipped official or custom Chrome OS no matter what would be ok, if there is a memory for that.